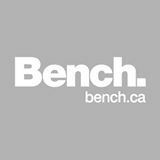 Bench is a brand with a long, proud and illustrious cultural history. With a reputation for producing easy-wear-clothes with a functional design it continues take its inspiration from global city cultures and the dynamic young people who bring them alive. Bench is an active-inspired brand which designs clothing and accessories for men, women and kids for their everyday 24 hour life. Born in the UK back in 1989, it can now be found in more than 30 countries worldwide.